1st, 2nd, & 3rd prize winners deliver their speech to fellow graduates, friends, and family at the Department of Communication Undergraduate Recognition Reception - Saturday, April 28, 2018. Pizza after contest - Friends and family welcome! 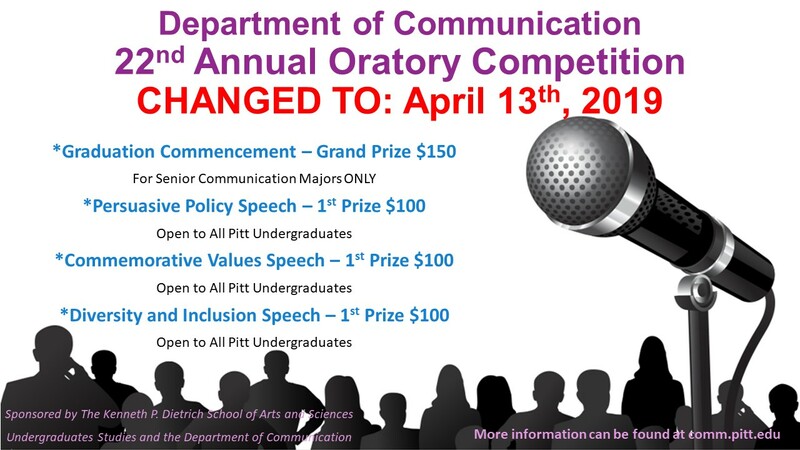 Email your entry form by April 12, 2019 to speaklab@pitt.edu. Detailed category descriptions and entry form here! Sponsored by The Kenneth P. Dietrich School of Arts and Sciences Undergraduate Studies, Department of Communication, and the Communication Club.